What better way to honor the nation's veterans than buying Newt Gingrich's latest novel? Newt Gingrich has been repeatedly claiming that he is mulling a presidential run. But there's also evidence -- including the statement of his ex-wife that all he wants to do is make money -- that Gingrich is traveling around the country in order to raise millions of dollars for his network of political organizations (while simultaneously promoting himself and spending millions of dollars on chauffeurs and private jets). The latest evidence is the below e-mail, sent out today from Newt.org. It arrived under the subject line "Happy Veterans Day!" 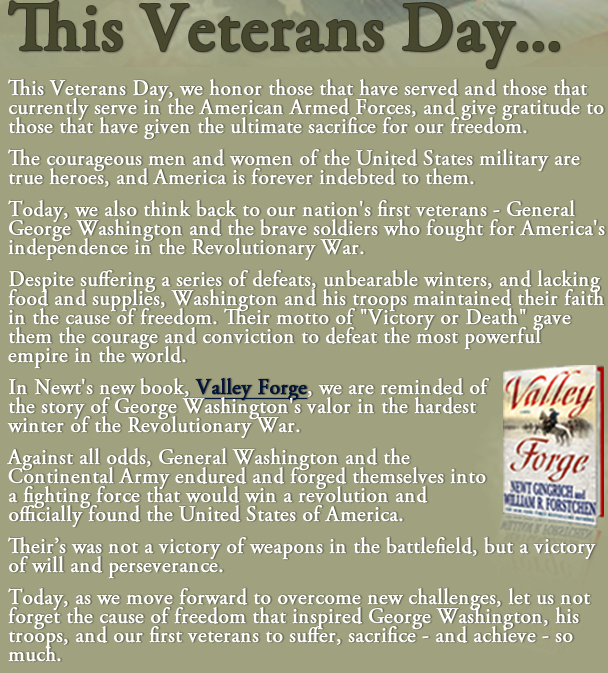 If you click anywhere on the e-mail, it takes you to the Amazon page for Gingrich's new novel, "Valley Forge." Booklist describes the novel, co-written with William Forstchen, as a "fair-to-middling fictional adaptation."